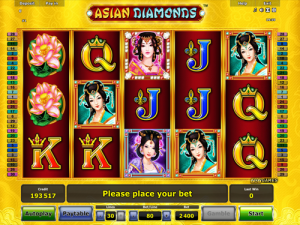 Asian Diamonds is a 5-reel, 30-payline slot game made by Novomatic. It’s an absolute diamond and it pays like one as well! The RTP percentage of Asian Diamonds is over 95%! The whole game is stunning. The colours and the design are super elegant and super oriental! The background is a glorious golden cloth! Its intricate pattern looks as though top seamstresses have embroidered it painstakingly in gold thread. The logo for Asian Diamonds is written in an oriental-style font in yellow and blue. The symbols are all elaborate and vividly coloured, each one individually created in great detail! The game is a typical slot from Novomatic. The settings, the music and the features have all been seen before! The autoplay, paytable, gamble and settings will all be found in the same places. Asian Diamonds has Free Games, too! This slot can pay out big time due to its stacked symbols. The stunning geishas and the other Asian-style symbols will transport you to another time and another place. This slot game will truly captivate those of you who have a fondness for travelling and experiencing new cultures! Regular slots players who have a soft spot for Novomatic games will find that Asian Diamonds has everything they could want! It’ll be especially suited to players who already love their games: Asian Attraction, Showgirls, Cleopatra and Amazon’s Diamonds. Every single symbol in this game is exquisitely designed! There’s so much detail in every symbol that you could almost write a study on each one individually. Even the symbols which pay out the least amount of money are detailed – they’re not just simple and boring! Each card value has its own embellishment: the Jack has a fleur de lys; the Queen has a crown; the King has a crown and the Ace has two sparkling diamonds! Symbols that give out bigger payments are a bit more detailed! There’s a pink lotus flower, blooming beautifully! Then there’s the four Asian princesses, who are so beautiful, they shine like diamonds! There’s a blue Asian princess, a purple Asian princess, a turquoise Asian princess and a pink Asian princess. The two highest-paying princesses (the pink and the turquoise one) can pay from two matches or more. The other symbols can only pay with three or more matches. In total, Asian Diamonds has 30 paylines. It’s your choice how many you want to activate and how much you want to bet on each one. They all pay the same direction (left to right) and require matching symbols to land consecutively before they pay out. The highest win per line is paid. Each symbol has its own payout values and they get bigger the more matches you make. Payouts also all increase or decrease relative to your bet per line. This can be set anywhere from 0.01 to 15.00. Highrollers will love this option for big bet spins! Asian Diamonds has both Wild symbols and Scatter symbols. The Wild symbols are stacked, like the ordinary symbols are! They pay out like a normal symbol from 2 matches and they can also fill in for any other symbol – but not for the Scatter. The Scatter symbol is a golden ball and this is the symbol that can give you Free Games! The Free Games in this slot game are like a diamond in the rough! They’re pretty simple but they pay out big time! You can win up to 32 Free Games in Asian Diamonds. The Scatter symbols are stacked and they turn up on the middle three reels only. 7 symbols give you 8 Free Games. 8 symbols give you 16 Free Games and 9 symbols give you 32 Free Games. During the games, the Scatter symbols disappear which means that you can’t re-trigger games but you’re more likely to get wins because the Scatter symbols don’t fall in the way and stop winning combinations from happening! The Free Games can be quite hit and miss but if they give you a good deal, you can win so much money!